130 million years down in history, times dramatically change, but one thing that has grown older and stronger is the rainforest of Taman Negara. Taman Negara is the world’s oldest tropical rainforest located in Malaysia. It offers surfeit of activities for every kind of traveller - nature enthusiasts, trekker, wildlife lovers and adventure seekers. Here are our top 10 things to do at Taman Negara with our Malaysia tour package. 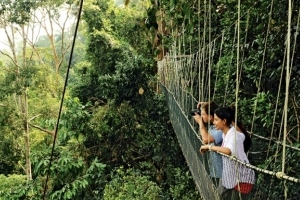 Boasting of longest canopy walk in the world, the Taman Negara Canopy Walkway gives you bird’s eye view of the entire national park. The trail is well marked and there are signposts that provide information about the birds, animals and plants that environ the area. The walkway is closed on Mondays. Entry fee for adults is RM5 and children RM1. One of the most thrilling experiences in Taman Negara is riding on the rapids along the gushing waters of River Tembeling. Flow through exciting seven rapids and swim along the waves. Rapid shooting activity is a must-try at Taman Negara for adventure seekers. A trek in the twilight observing the nocturnal beauty of nature is absolutely incredible. You will get a chance to encounter Malaysian wildlife that comes to life at night - the nocturnal animal kingdom of Taman Negara. The aboriginal tribes of Malaysia, Orang Asli are the nucleus of Malaysia. It is from here that the life originated trillions of years ago. In a country that boasts of tallest twin towers - Petronas Twin Towers; Orang Asli Kampung is a revealer of their art, culture and tradition. Spend the time with the ‘betek’ (local villagers are referred as betek) and learn about their settlements. Learn the obscure art of hunting by blowpipe and much more. Bukit Teresek trail is one of the most scenic trails in the Malay Peninsula. Dense jungle, variety of flora and fauna and diverse wildlife underlines the trail. This trail is a chicken soup for the trekker’s soul. Being the highest peak in Peninsular Malaysia; Gunung Tahan tests endurance, physical fitness and power of a trekker. You can trek via two paths - Sungai Relau and Kuala Tahan. The toughest and the longest route will take around 7 days to complete the trek. Though the trek is long and challenging, it is undoubtedly one of the best treks in Malaysia. You will traverse steep ridges, walk rocky paths and ford several streams to reach the summit. Not everyone’s cup of tea, cave exploration is an activity that leads into unique chamber systems. You will see bats hanging from the rock ceiling and much more. You can even go a jungle trek and rest for a night in near-by caves like Kepayang Besar, Kepayang Kecil, Luas and Daun Menari. A tropical rainforest that it is, Taman Negara has distinctive wildlife and is regarded as one of the best places in the world for bird watching. Although there are several posts with information on the unique species endemic to Taman Negara or Malaysia, for that matter; it is better to go on guided birding venture. Taman Negara inhabits rare animals like crab-eating macaque, Malayan gaur, Asian elephant, birds like Malayan peacock-pheasant, red junglefowl, green broadbill and many more. 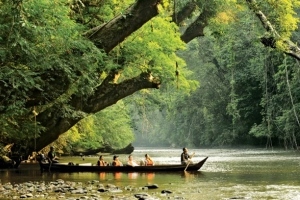 A fisher’s paradise, Taman Negara is famous for conducting fishing excursions. Catch popular Malaysian fishes like kelah (Malaysian red mahseer, patin, sebarau, Malaysian jungle perch, Hampala Macrolepidota), Baung, Toman, Tenggalan, tapah and many more. Cascading waterfalls that plunge from enormous heights are seen all around Taman Negara. You can even take dips and enjoy the water-splash game! Prominent waterfall hot spots are Four Steps Waterfall and Lata Berkoh. Sounds exciting, isn’t it? Book our Malaysia tour package now and explore Malaysia off the beaten track with an excursion to Taman Negara.